All of our year 6 children went to London for the day - see separate blog entries for The National Gallery and The Sound of Music. The journey in and out of London was also fascinating. On the coach and on foot we managed to see many of the great London sites such as Britain's tallest building (Canary Wharf - where Mrs Elphick's son works), the Millenium Dome, River Thames, Tower of London, Big Ben, The London Eye, Trafalgar Square, Oxford Street, Picadilly Circus, Horse Guards Parade, St. James's Park and Hamley's Toy Shop! Have a look at these movies to get a feel of the great day we had in London. You need to click on the play button and wait about 20-30 seconds for 'buffering'! Class DB (Year 6) had a lesson from a visiting langauage teacher (from Thomas Mills High School). They learnt how to say and write one of the Japaneze alphabets - there are several. The children that are going on this trip do not need to come into school until 10.30am on Thursday 31 January but can still come in at the normal time if you wish. SCC Catering are promoting school lunches this term with special theme days. The first one will be on Monday 28 January and the theme is ‘Smile – Be Happy’ look out for the special menu in the usual places. It is very helpful for the office staff if all dinner money, whether for all week or just one or two days a week, is brought into school on the Monday of the week concerned and not individually through the week. We would also request that dinner money or return slips for trips be handed into the class teacher (in an envelope please) rather than the office, unless otherwise indicated. This helps the children understand responsibility and would help with the congestion at the school office in the morning. A reminder that there is storage space for bicycles, next to the re-cycling area at the back of the school. Any child who has been on the cycling course with Mr Byer may apply to cycle to school. The bicycle must be in road worthy condition, and a safety helmet must be worn. It is recommended that a bicycle lock is used when parking the cycles as the school is unable to take responsibility for cycles damaged or stolen from school premises. There is limited space available and preference will be given to those who are unable to walk to school. Please complete the slip overleaf and return by Friday 8 February to the school office. We have started to receive holiday requests for next academic year and I would like to remind parents that, as last year, it has been decided that any request for absence during the first week of the new academic year will NOT be Authorised (Tuesday 2 September - Friday 5 September). These first few days of the new term are when the children find their place in the class and are busy making friends and we have found that children arriving late into the established class often feel isolated and confused, and often take longer to adjust to the changes and settle down. Any absence due to holiday during the first week of term will be marked in the register as ‘Unauthorised’. The booklet ‘Attendance – A Guide for Parents is available form the school office. Please can I also draw your attention to the dates for SAT’s and Teacher Assessments week which are Monday 12 May to Friday 16 May. It is essential that all children in Year 2, Year 3, Year 4, Year 5 and Year 6 are present in this week. I will not authorise holiday for these five year groups during the period of SAT’s. Could we also remind parents that we need at least two weeks notice for an absence request. Thank you for your help in this matter. Class DB have taken photographs of themselves and used them to create a self portrait in pencil. You can see the original photo, black and white (greyscale version) and the drawings. In art, with Mrs.Mawson we have been learning to draw portraits. One week we took a photo of our table partner practising getting the right light and shade into it using a big white board. Then we put it onto Word and made it black and white. Then we printed them out. Mrs.Mawson handed them out, then we cut them in half. Afterwards we used chalk and charcoal to draw our face concentrating on the light and shade. We very much enjoyed it! See examples below plus a film of their final portraits. The school chess teams are taking part in a local schools league. Here are some pictures from recent games at Nacton Primary School and the Royal Hospital School. In Mr Brook's maths lessons we have been using 'Mathonaire' as an interactive voting exercise with 'Activ Vote'. We choose A, B, C or D depending on the most popular answer from the whole class. We have got as far as 500,000 points. Click on the picture to go to a website where you can play the game yourself. 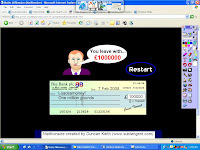 Mr Brook's maths group won a million - can you spot the mistake on this image taken from the mathonaire website? Here a few examples of short films taken during the building process. The children in the computer club are still working on their films - they should be finished next week and will be put on to this blog. This week the roof has been finished and joined on to the existing roof. The cladding is nearly finished on the first floor. I have also been able to see inside the two classrooms. An electrician is now working inside the 2 rooms. Miss Long (one of our former teachers) is currently working in Ethiopia. She came back (on holiday) in January to see us and brought in some wonderful photos. The images of the contryside, wildlife and villages are particularly interesting. It was also fascinating to see (and hear about) images of an Ethiopian school. Miss Long is going to work in Africa for two years. Although she misses Framlingham she is really enjoying working in Ethiopia and finding the experience very rewarding. On the 17th January, the Travelling By Tuba people visited our school. The men who ran it were called Stuart and Chris. They were going to lead us through a journey of how the Tuba works and where it came from. The first instrument we learned about was the conch shell. It was used about 10,000 years ago in India. It makes a medium pitched sound. If you put your hand in the opening the sound gets lower. The next instrument was the Viking Animal Horn. It was used in wars, and makes a high-pitched sound. The Didgeridoo was the next thing they showed us. It was made in Australia out of wood and termites eat the middle out. The Didgeridoo makes a low sound and has only three notes. Two people got the chance to try it out! It looked very hard to play! Our next activity was a song that Chris played on the tuba. We had to bow our heads and shut our eyes and imagine we were beside a river in Africa. Next was an instrument called a cornet, it is about 600 years old. It had an acorn shaped mouthpiece. It made an extremely high pitched sound. The next instrument was the Sackbut. The Sackbut works in the same way as a trombone. The cornet and the Sackbut were played to together for the King or Queen. Another volunteer got to come out and play the drums with the cornet and the Sackbut, it was meant to sound like a marching band. We now learned how a Tuba works. Chris and Stuart showed us a hosepipe and said this was the same length as the pipes in the tuba stretched out. Chris showed us the bell of the tuba and asked somebody to stick his or her head inside it, and it fitted! We learned about the Posthorn and that it was used by postmen to show that he had delivered. It was used 400 years ago. Chris and Stuart had made a hose-a-phone. St uart played a tune and we clapped along. The Hose-a-phone and the real posthorn made a high sound. Stuart and Chris then talked about Dobby the dancing pony and that we weren’t allowed to bring him in the school. They chose two people and they were meant to be each half of Dobby. They were given two halves of a coconut to sound like hooves and they banged along to the music. The first ever tuba was called a serpent because it looks like snake. Chris played it and it was very quiet and out of tune with the piano. It was used about 400 years ago. We learned about the valves on the tuba. They change the notes. Next, the real challenge! Stuart has to play all 75 parts of the orchestra, but did he manage it… YES! It was the 1812 overture, they played it during war. Chris put confetti into this thing and it shot out! Next was the American Sousaphone, it was invented by Mr Sousa as a variation on the tuba. This was done because the tuba was too heavy to carry around all day in a marching band. It has a very strange shape so it wraps around your shoulder. Next, they needed 9 people to play some percussion instruments. There were the maracas, kabasa, cowbell, guiro, tambourine, claves, shakers and a triangle. They played the Bear N ecessities. Chris then serenaded all of the lady teachers with his tuba. After that, it was the end! By Laetitia, Rob, Caroline, Kitty and Daniel. Advance tickets are £2 per player (child or adult) and include 6 games. Cost £2.50 on the door. Ticket requests should be left at the school office. Robert Hitchams chess club is now putting out 3 chess teams to play against other schools. Last week the B Team went to the other side of Ipswich to Holbrook primary as part of the Woodbridge chess tournament. Our team had 6 players (5 from year five : Alfie, Harry, Luke, Charlie and Duncan and 1 from year 6: Jake). Robert Hitchams got off to a good start when Duncan captured Holbrook's number 5 with a quick checkmate. Straight after that Holbrook bounced back when capturing Jake with a misunderstanding in the pieces. Then disaster struck, a 5 minute checkmate from Holbrook's number 2 against Harry. From then on things just went further downhill for Robert Hitchams as one by one players fell to Holbrook,s. In the end Holbrook won by 5 to 1 with Duncan being our only winner. After the match we all had a large snack including drinks, mini pizzas and sandwiches. "It was worth coming just for the food", said Alfie and Charlie. The outside of the building is nearing completion. This week the builders have been fitting the wooden cladding and working on the roof. The children in the lunchtime computer club have been using 'movie maker' to make their own films about the making of the building. Some of these will go on to to blog next week. We also hope to show you some pictures taken inside the new building. Mr Brook (ICT coordinator) and Mrs Elphick (Headteacher) spent a day at the BETT show at Olympia in London. BETT is the annual exhibition for ICT in education. All of the companies that make ICT equipment and software show their new products. BETT is an enormous exhibition with thousands of visitors from around Britain and Europe. The companies come from all round the World. The movie below shows some of the things which grabbed my attention at the show. The builders have started work again after the Christmas holidays. This week they have been working on the curved roof and the wooden cladding on the top flo or walls.